"In all my work I use my vocabulary of symbols in the hope of touching emotions beyond the reach of words." Rusty Cantor's lexicon of symbols is formed from the common memory of civilization. Many of them have decorated artifacts for tens of thousands of years. Images of fertility, water, creativity, death, and regeneration. 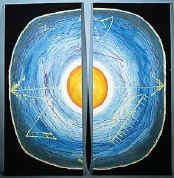 Having produced art in a variety of media-paint, glass, bronze, marble, found objects-and with a variety of techniques, Cantor enjoys every nuance of creation. Determining new ideas. Choosing colors, materials, and sizes. Her drive is intuitive, intellectual, physical, and emotional, making for a very satisfying experience that uses all of her ability and talent. There is more information about Rusty at www.varoregistry.com/cantor/.